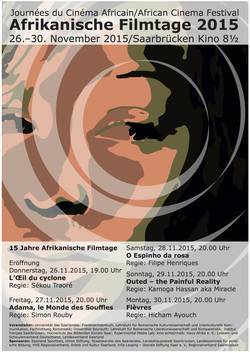 The IRTG Diversity's Christoph Vatter is involved in the organisation of the 15th African Cinema Festival in Saarbrücken. "Each year, a new edition of the African Cinema Festival introduces the work of 'anglophone' and 'francophone' African filmmakers, directors and critics are invited to introduce the various cinemas of the continent and its diaspora. Since its foundation in 2001, the African Cinema Festival has developed into an inter-departmental and inter-university media and research project and assumed a central place in the cultural life of the city of Saarbruecken as well as the larger (cross-border) region."